Dance Marathon was last weekend, and I still haven’t caught up on my sleep. For those of you who don’t know, Dance Marathon is an event put on by Hope that raises money for the Helen DeVos Children’s Hospital. Participants sign up for the full 24-hour shift or 8-hour shifts, and we all gather in the Dow for fun activities, dancing, and fundraising all night. You’d be surprised at how long you can go until your feet start to feel like they’re going to fall off. The coolest part of the marathon is hearing the stories of the families that you’re raising money for. Personally, this is what kept me going throughout the night. Being given a reminder as to why I was there, still awake and feet killing me, gave me all of the reason to go on. Besides the speakers, there were various music groups that came, inflatable bounce houses, a pancake making competition (delicious), yoga, zumba, kickboxing, snacks, meals, and pool-time (time to dip your feet in the pool) to keep us busy. There was even a line-dance that they taught throughout the night that kept us all busy! In addition, there was a schedule of themes for certain hours; you dressed up for the theme and your team could get points! 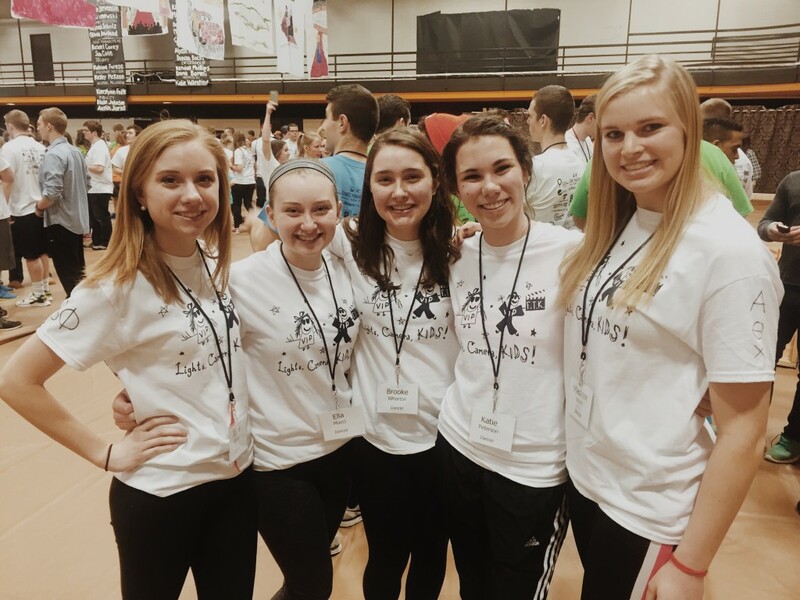 I’m pretty proud of the positive attitude that I kept going at Dance Marathon this year… I didn’t really start getting grumpy until after lunch on Saturday morning, and at that point we only had four or five hours to go. I found the experience to be very rewarding. Tiring, but rewarding. At the end of the experience, all of the participants circled around the Dow and the families went around and said goodbye to us all. I could tell by the tears on one of the miracle child’s (one of the kids from the hospital!) face that the time spent really meant a lot to her too. My heart was touched. Our marathon raise $182,187.30 for the children of Helen DeVos Children’s Hospital. It’s truly a remarkable event that continues to raise more and more awareness and funds each and every year. I’m so glad that I got to take part in it! Wow. What a weekend…This last weekend was Dance Marathon. This is an extraordinary event where all the money that is raised goes towards the Helen DeVos Children’s Hospital. This money is raised through fundraisers, but also through donations brought in through the participants of Dance Marathon. On top of the participants raising money, they stand on the feet for 24 hours in order to support the kids who are daily fighting their battle against their illness. This whole event is all for the families of kids at the Hospital, and for the kids themselves, to make them feel like superstars. This year for the marathon, I had the honor to serve on the Dream Team (the 28-ish students that put the Marathon on) as the Morale co-chair. One of the duties of this role is making and choreographing a 9-minute line dance that is taught throughout the entire Marathon. This is a project that my morale co-chair and I have been working at since the first semester and finally taught it to the DM participants last weekend. Last year, as a freshman, the Marathon meant a lot to me, mostly because it was a lot of fun as I love to dance and have unnatural surplus of energy – thus I didn’t get tired. This year the Marathon had a whole new spin. A lot of that was due to the larger role I had within it, but also due to the situations I went through leading up to the event. As some of you may be aware from reading my other blogs, I recently sprained my ankle. After I sprained it and got off my crutches, I re-sprained it just shy of 3 weeks before Dance Marathon. This was a moment that was crushing in my life, yet also humbling. In this moment, I made the decision that it was not fair to myself, to my co-chair, to the rest of Dream Team, to the participants at Dance Marathon, and most importantly to the kids to continue on in my duty if I wasn’t fully able to enact in it. It was in that moment that a lot of pride was broken down inside of me and that I realized how little this event truly had to with me, but was 100% for the kids being treated at Helen DeVos Children’s Hospital. Fortunately, my ankle was healed in time for the Marathon and I was able to continue in my duties as Morale-Co Chair, yet now I had a much healthier and correct perspective. Due this mindset, this year’s Marathon was a lot more emotional as well as passion driven. I loved hearing the families share their stories and I found it very moving. I am so proud to be a part of this organization due to what it can provide for these families that have gone through so much. I am also proud of how at this year’s Marathon, we were able to raise a record amount of money and well as have a record amount of participants. I thank God for the events that led up to this marathon, including re-spraining my ankle, because if I didn’t stumble, that I would have seen the Marathon through blind eyes. If you are reading this as a prospective student or a student that has never done Dance Marathon, I encourage you to do it next year and allow these families stories to move you as they moved me. Happy Friday, Hope College! I hope this week went by fast for you and the next few do for you too, it’s almost Spring Break!! As you all probably know, there’s only a week until Dance Marathon! I truly can’t wait for the freshmen class to experience this awesome event for the first time. I know that last year when I was a freshman, I had no idea what to expect, but by the time it was over, it was one of my favorite events of the year. Last year, I participated in Dance Marathon as a dancer – that means a full 24 hours on my feet dancing and raising my goal for fundraising! It was a great experience, but one I unfortunately couldn’t swing this year. So instead, this year I will be participating as a moraler. This means I’ll only be required to stay at the marathon for an eight hour shift to support the dancers. Even though I’m only REQUIRED to spend eight hours moraling, I’ll most likely spend a lot more time there since there are so many fun events that make the marathon worth being at! Both dancers and morales (and anyone else that is involved with Dance Marathon) have the opportunity to raise as much money as they can for the Helen DeVos Children’s Hospital. Last year Hope raised $139,041.13 – an amazing new record! In addition to raising money, organizations through Hope, such as Volunteer Services and certain sororities and fraternities, sponsor children that have been or are still going through Helen DeVos Children’s Hospital. Last year since I was on Dykstra Hall’s team, I got to help sponsor Riley Jo – the cutest little girl with the greatest personality! This is Riley Jo! I believe Dykstra Hall will be dancing for her again this year. 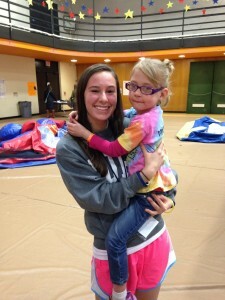 She’s the sweetest and her and her family both love being involved with Dance Marathon! If you’re involved with Dance Marathon this year – great! Keep raising that money and prepare your bodies for a great 24 hours. If you aren’t involved – that’s ok! Anyone is welcome to go and watch the marathon at any time in the Dow next Friday, March 7th-8th. It starts at 5pm and ends the next day at 5pm. There are different events like a lip sync competition between teams, and different theme hours throughout the night so make sure to come on out and watch! Hope to see you all there next week! Until next time, readers. Posted on February 27, 2015 March 2, 2015 Author Mikaila BissonCategories Campus LifeTags dance marathon, dm2015, For the KidsLeave a comment on Do it For the Kids! “Mafia in the Woods” anyone? This weekend, I went on a fantastic retreat with this group of people. 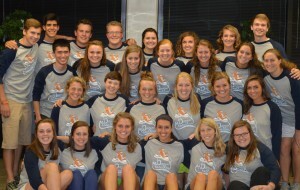 These guys and gals are what makes up the Dream Team for Dance Marathon. Dance Marathon is event put on by Hope College that raises money for Helen DeVos Children’s Hospital. The actual Marathon is a 24 hour event where people stay on their feet for 24 hours straight. You get to dance, play games, hear hospital children’s stories, and so much more. Last year, was the first time I did Dance Marathon and it changed my life. This year I am on the Dream Team – a group of 29 students that put on the whole marathon! It is a ton of work, but so worth it. What makes it worth it, is the kids. It so satisfying being a part of the kid’s journey and to get to help them through battling their different diseases. This weekend I had the opportunity to actually tour the Helen DeVos Hospital (which is more like a hotel!) and get to know the members of my team better. We stayed at a log cabin in the woods. We had a TON of fun. One night, we shut off all the lights and played Mafia. People were bumping around in the dark, screaming as they ran into people, and some townspeople were dying until they were able to uncover the Mafia’s identity. It was a blast. This retreat was so good and makes me extremely excited for the upcoming Dance Marathon. FOR THE KIDS!!! At the end of the retreat, we said kind loving things to team members by passing them the ribbon to someone and then saying something kind to them. Posted on September 6, 2014 September 8, 2014 Author John Luke HawkinsCategories Campus LifeTags dance marathon, dream teamLeave a comment on “Mafia in the Woods” anyone? Happy Tuesday night, folks! I just want to post about my weekend. It really was mundane, I did a bunch of homework, cleaned my room, did some errands and just relaxed. Sometimes, I wish that there was more time in the weekend. We could all use some more time, right? Anyways, the highlight of my weekend was the 5K For The Kids sponsored by Hope College Dance Marathon! It was so much fun to run with friends for such a great cause! Hope College Dance Marathon helps kids who are currently experiencing childhood cancers. They have done an amazing job raising money for the kids! 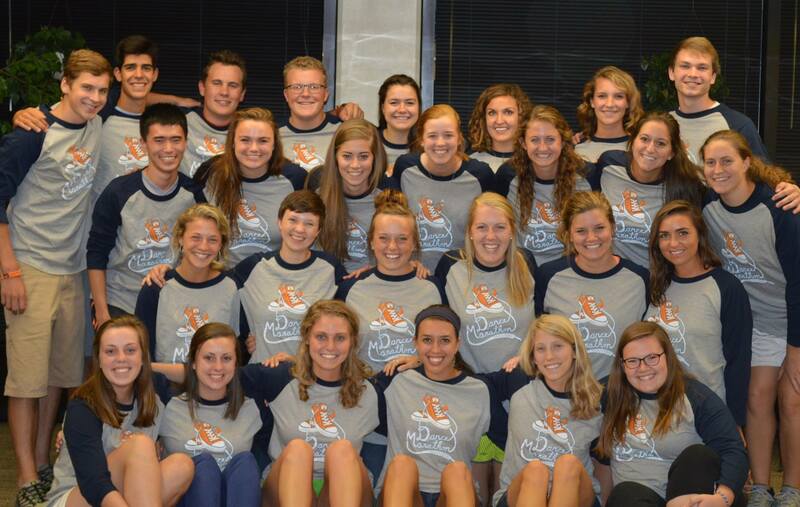 It really is such a cool thing Hope College does to serve our community. If you want to learn more about Dance Marathon, just click! Anyways, I just wanted to share some of my pictures from this weekend’s 5K. It was a great short race, and I was prepared for it because I have been running! I hope you enjoy the pictures! I know this is a short post, but don’t worry, I’ll be posting more this week! If you haven’t already, make sure you follow me at @HopeMarvin15 on Twitter!